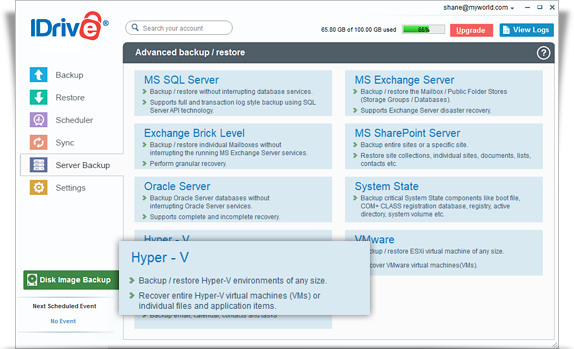 A single backup and recovery solution to protect your virtual environment. Hot backups with MS VSS Integration: Backup live Hyper-V VMs with zero downtime by leveraging Microsoft's VSS Hyper-V Writer. Reduce complex methods for protecting virtual machines. Instant restore of all servers in virtual environment. Backup your Hyper-V environment with convenient features like single step backup process, Instant restore and high security. View the steps to backup Hyper-V.
Quick and easy restore of your backed up Hyper-V virtual machines using IDrive's cloud based technology. View the steps to restore Hyper-V.